The Douglas Hyde Gallery is pleased to present a new series of invited solo exhibitions in Gallery 2, titled ‘the artist’s eye’. Acknowledging the crucial role artists play in influencing and shaping other artistic practices, this series asks those exhibiting in Gallery 1 to invite an artist of significant influence to present work in Gallery 2. For the first instalment in this series Abbas Akhavan has invited Mona Hatoum to present the film Roadworks (1985). 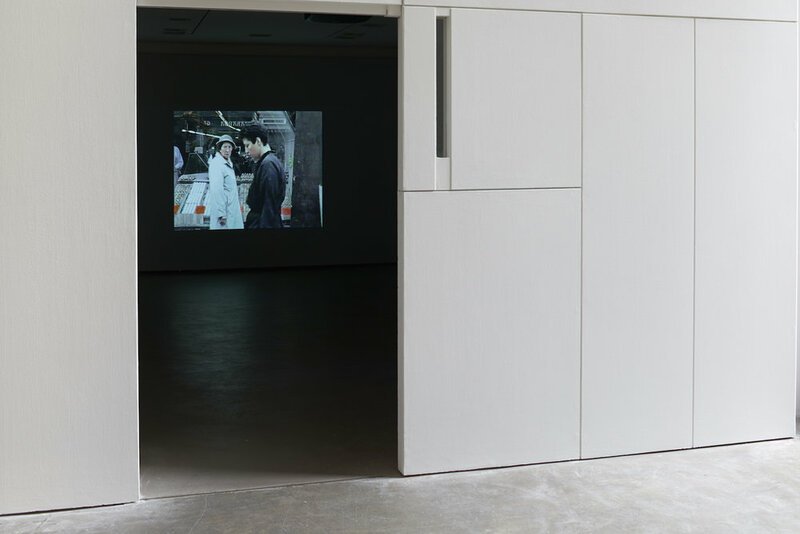 This video dates from the early stages of Hatoum’s practice, though she had already been living in London, where she is still based, for ten years. Perhaps most renowned now for her work in sculpture and large-scale installation, throughout her career she has adeptly subverted the familiar to unsettle and discomfit the viewer. Roadworks documents a performance which took place in Brixton in South London in 1985, during which the artist walked through the streets, barefoot, with a pair of Dr Martens boots laced around her ankles. With deliberate yet halting steps, she threads her way through the crowds, to the general bemusement of passers-by. The simple gesture of exposing her feet and displacing the function of the shoes, combined with her laboured movements, sets Hatoum vividly apart from the busy routine surroundings. The act of walking has become fraught and the vulnerability of her feet is accentuated beside the weight of the leather boots. Dr Martens shoes also carry a heavy weight of cultural references; being associated with a wide range of counter cultural movements while also worn by the police in England at that time. Referring to the period in which this work was made, Hatoum has said “I was venting my anger, without caring what people thought. I was very restless. I couldn’t sit with something for too long, so performance gave me the possibility of work that was immediate, unpremeditated. It was improvised. I didn’t rehearse; I would just turn up with my props.” (1) The entire performance, staged as part of a three-week long group exhibition of the same name, lasted for more than an hour and was later distilled into this six minute video. Hatoum has also spoken of her preference to make work locally, to spend time in a place and to work with the materials of her chosen location. Intrinsic to this video is the particularity of the streets, the glimpses of market stalls, the gaze of the onlookers. More specifically, the particularity of Brixton as a site of police violence and economic deprivation is key. Through her body the artist links her personal fragility to the precarity of the local community. Born to a Palestinian family in Beirut, Mona Hatoum studied at Beirut University College, and the Slade School of Art in London, where she settled at the beginning of the 1975 Civil War in Lebanon. She has had major solo exhibitions at the Menil Collection, Houston, Texas; Centre Georges Pompidou, Paris; Tate Britain, London; the Museum of Contemporary Art, Chicago; and the Arab Museum of Modern Art, Doha, among other institutions. Hatoum was a nominee for the Turner Prize, 1995; was included in Documenta XI, 2002, and the Venice Biennale, 1995 and 2005; and was the winner of the 2011 Joan Miró Prize. To coincide with this solo exhibition there is programme of talks, readings, events and film screenings. The opening of this exhibition is kindly sponsored by O'Hara's Irish Craft Beer. Image: Mona Hatoum, Roadworks, 1985, Performed for ‘Roadworks’, Brixton Art Gallery, London. Colour video with sound, duration: 6.45 minutes. © Mona Hatoum. Courtesy Kunstmuseum St. Gallen (Photo: Stefan Rohner).